Features a low profile contour at the palmar crease to allow for full finger dexterity. The lightweight laminated foam glove with separate hook and pile cinch fasteners provides support and compression to the wrist to help relieve swelling and minimize pain. 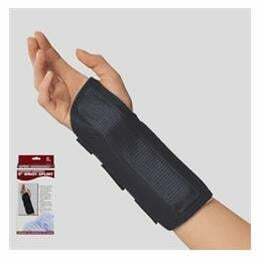 The preshaped metal splint prevents painful wrist flexion, and holds the wrist in a neutral position to promote healing. Perfect for latex sensitive wearers. Available for the left or right hand.